Ever heard of quinoa (“keen-wah”)? Sounds weird right? But quinoa has so many health benefits, it’s worth giving it a try. It’s a complete protein! It’s rare to find a plant food that delivers all 9 essential amino acids, but quinoa does just that. And to top it off, with about 8 grams of protein per cup, it’s an excellent plant based protein source. Although still a low-fat food with only 4 grams of fat per cup, quinoa is much higher in fat that wheat and other grasses. It contains oleic acid, which is a healthy monounsaturated fat found in olive oil, as well as alpha-linolenic acid (ALA) which is a healthy omega-3 fatty acid. And even better, these healthy fats remain stable when cooked rather than becoming oxidized like most other fats. Quinoa is highly nutritious. It contains substantial amounts of manganese, magnesium, phosphorus, folate, copper, iron, zinc, potassium, and vitamins B1, B2, and B6, as well as a little bit of calcium, niacin, and vitamin E. Aside from the vitamins and minerals there are tons of trace nutrients such as the antioxidant flavonoids quercetin and kaempferol, which have been shown to have anti-inflammatory, anti-viral, anti-cancer, and anti-depressant effects. It’s high in fiber. 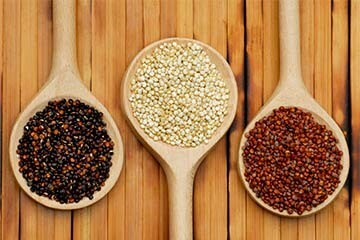 With about 5 grams of fiber per cup, quinoa helps keep you full longer and helps to maintain your blood sugar levels. It’s a low-glycemic food, which means it exerts little blood sugar stress on the body. It has a glycemic index of about 53, which is considered low. But keep in mind that it is still a high carbohydrate food, and therefore not a good choice for a low-carb diet. Quinoa is usually grown organically and is non-GMO! Which means it’s free of pesticides, herbicides, and genetically modified organisms! It’s naturally gluten free! Great for those who are sensitive to gluten or have Celiac disease. Quinoa is a much healthier alternative to many of the gluten free products on the market. It’s so easy to incorporate into your diet! Depending on the type of quinoa, you may need to rinse it to get rid of the saponins on the outer layer which can be bitter, but many brands have already been rinsed. Then just 2 cups of water for every 1 cup of dry quinoa boiled for about 15 minutes produces a nice fluffy quinoa. Use it instead of rice or other grains in your favorite dishes!